Subscribe to the Green Stone of Healing(R) newsletter for a free healing ebook. New to the Green Stone of Healing(R) series? This brief video tells more about this unique speculative epic. Author C.L. 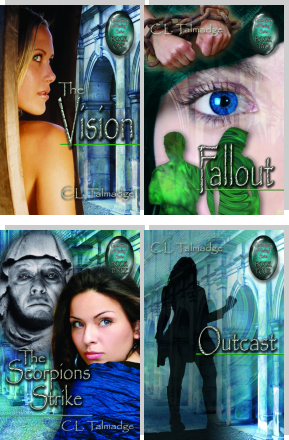 Talmadge discusses the fantasy setting and other topics with BlogTalk Radio show host Nikki Leigh. What happens when politics, passion, and piety collide? The resulting global cataclysm obliterates a mighty nation and nearly destroys the world. Welcome to the website of the Green Stone of Healing® speculative epic. This saga is a unique blend of action-adventure, alternate history, palace intrigue, the paranormal, and undying romance. This serialized fiction chronicles how state backing for an exclusionary religion leads to worldwide destruction that sweeps away all traces of a powerful island country called Azgard. Four generations of strong-willed women inherit a mysterious green gem revealed to mend broken bones and broken hearts, protect against human and natural assaults, and render its wearers undetectable. These courageous protagonists use their jewel to offer a loving, inclusive alternative to theocrats who persecute those who do not look like them or share their beliefs. Readers who become fond of these characters will be delighted that they reincarnate on their spiritual sojourns, affirming that not even death can divide lovers and loved ones (or enemies). More information and book reviews. Boomer women who desire greater self-assurance are delighted to take their intuitive skills to a new level by meeting their spirit guides with help from C. L. Talmadge. Tapping their guides� wisdom on a daily basis enables these women to trust themselves more in every aspect of their lives, enhancing their personal and professional relationships. Trained as an energy-healer, C.L. has been taking clients to meet their guides since 1988. Her mission is to awaken others to the unlimited practical benefits of true holistic living, which actively incorporates the spiritual and emotional bodies as well as the physical and mental self. Part of her mission is writing and publishing the Green Stone of Healing® series. Under the byline Candace Talmadge, the author since 1976 has written for numerous media that include Adweek, Business Week, the Dallas Times Herald, Forbes, the International Herald Tribune, The New York Times, and Reuters America. She has also been a syndicated political columnist whose works have appeared in publications such as Liberal Opinion Week. In 1999, C.L. published nonfiction about emotional and spiritual healing resolution based on the Sunan method of working in the energy of human consciousness. In this book, she provides an expanded definition of energy that demonstrates the connection between matter, spirit, mind, and heart. Those who sign up for the occasional newsletter receive a free .pdf copy of this book. To write her series, C.L. delved into her own past lives and those of her family, friends, clients, and acquaintances. The fictionalized result is the series presented in this website. The author resides in Texas with her partner and editor. Readers may contact her here.